I’m co-running a new Code Club at Bentilee Library with Samuel Freeman. 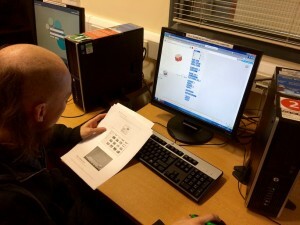 It is the first Code Club to run in a Stoke-on-Trent library. It has run for three weeks and it has been excellent. The kids have been learning to program games using Scratch. The Sentinel stopped by last week to see what was going on and wrote a great article. Samuel Freeman setting up Bentilee Library systems for Code Club.